Once the new boiler was in place the piping could be reconnected. 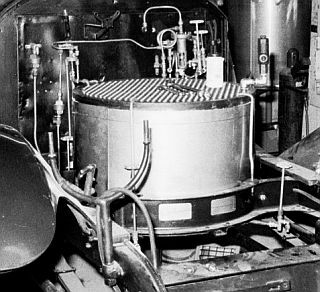 This photo shows how the boiler is mounted within the framework of the car. Four hold down rods insure that the boiler remains secure. Once all the piping was installed the boiler was again filled with water and a 600 PSIG hydrostatic test was performed to insure there were no leaks in any of the boiler’s water supply or steam piping.